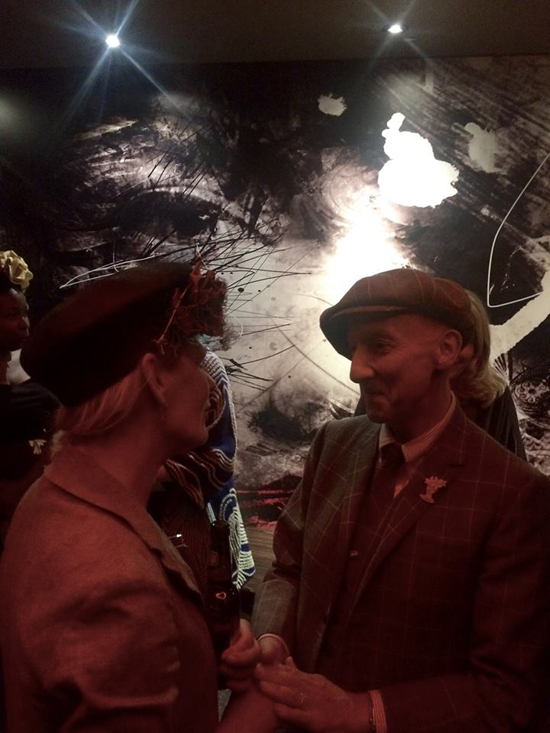 What a wonderful experience it was to meet my millinery hero Stephen Jones last week. I went to a talk at the Dirty Martini cocktail bar in Monument, London as part of the London Hat Week. The talk was an informal chat between Hilary Alexander (former fashion editor of The Daily Telegraph, amongst other things), and Stephen Jones. When I first became interested in hats, in the early 1990′s, I became aware of Stephen and his talent. He was always, in my eyes, the witty milliner. He had a great skill in technical millinery, but his imagination and artistry is what made his work resonate with me. I aspired to his abilities and have made many copies of his hats, not to sell, but to see if I was able. He has had an amazing career hatting royalty, celebrities and being the milliner of choice for many designers on the catwalks. He now runs the millinery workrooms at Dior, and has remained my favourite milliner to date. He has inspired many and undoubtedly introduced trends and contributed to the popularity of millinery over recent times. He was chatty and witty during the talk and managed to get a few hats onto Hilary, making her smile, and was delightfully modest. He told us he used to drive a white van to earn a living whilst making hats in the evenings, and I related to his stories about the desire for a life in millinery whilst dealing with the practicalities of paying the bills! I managed to meet him afterwards and said he was one of my main inspirations, and partially responsible for getting me involved in millinery for which I thanked (and at times, didn’t) thank him! He was charming and held my hands, and I was able to present him with a small gift of a cross-stitch which I had made for him. It was such a thrill to hear him talk, and also to realise what a thoroughly nice man he was. Here he is….